Google has finally explained its mysterious logos and messages of the past few weeks, with the search giant admitting that it was a tribute to author HG Wells. , would be 143 years old – and Google has been celebrating the great man's birthday. 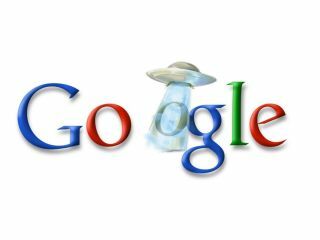 The messages included Google logos of a UFO and a cryptic message 1.12.12 25.15.21.18 15 1.18.5 2.5.12.15.14.7 20.15 21.19. This turned out to translate into "All your O are belong to us", a nod to the famous game Zero Wing. Another clue was the tweet of co-ordinates for Horsell Common – the location of the eerie first invasion for the Martians from The War of the Worlds. "Inspiration for innovation in technology and design can come from lots of places; we wanted to celebrate HG Wells as an author who encouraged fantastical thinking about what is possible, on this planet and beyond. And maybe have some fun while we were doing it," said a post on the Google blog. "The invasion of the logo by alien crafts and pods makes our series complete, but you'll have to read the book to find out how Wells' story really ends." We can confirm that neither Will Smith or sea water plays any part in turning back the invasion.